One of the worst things about global warming for the Northwest is that it can feed on itself: higher winter temperatures mean less snowpack, which means there's less water for hydropower, which means that more of our electricity comes from fossil fuels; burning fossil fuels feeds global warming, which means higher winter temperatures and skimpier snowpacks. And so on: a vicious circle if there ever was one. Of course, the specifics can be mushy -- though snowpack may dwindle if temperatures rise, Northwest may also get more total precipitation. Still, during the key summer months when California's electricity demand peaks, low snowpack can mean mean bad news for electric power up and down the west coast. That's what happened in 2001. The winter of 2000-2001 was a terrible one for snow, and the resulting drop in hydropower production put the squeeze on spare generating capacity throughout the west--which was what made it possible for Enron and others to manipulate power prices, precipitating California's electricity crisis and rolling blackouts. So it's worth noting that, as of last week, the snowpack in the watersheds that feed Seattle's dams had dwindled to match the meager levels last seen in 2001. See here: the green line is this year, the yellow line was 2001. 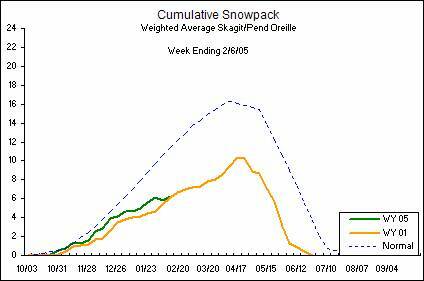 Thanks for the heads up on the snowpack - I'd seen a few things in the paper but this is a good reminder. In other words, it is more likely that we will see rolling blackouts again next year instead of more carbon burned.